All the communities in this region are within easy driving distance of the Greater Toronto Area. There are many diverse towns, examples of which include Caledon, Erin, Orangeville, Dufferin County, Shelburne, Mono, Township of East Luther - Grand Valley, East Garafraxa, Amaranth, Mulmur, Melancthon, Richmond Hill, Bolton, Nobleton and Burlington. Once outside the vortex of Toronto, you will discover a vast selection of rural retreats that make you think you are much farther away from the big city that you actually are. In the Hills of Headwaters there are 200+ artists working as painters, potters, glassblowers, woodcarvers, weavers, sculptors and jewellers. Fall Fairs and Farm Markets are featuring a great deal of organic and unusual products, not just ears of corn to be bought at the roadside! And don't forget the fall colours! 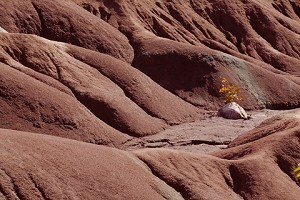 Caledon's fall colours are amazing and the town has its own badlands. Accommodations west of Toronto include hotels, motels, resorts, bed and breakfasts, and campgrounds. Located in Orangeville, this motel offers rooms with satellite TV and free local calls. Guests can benefit from free Wi-Fi, free parking and a 24-hour reception service. With air conditioning, all rooms come equipped with a fridge and work desk. Each has a private bathroom with a shower. The Osprey Valley Golf Course is 14 km from the motel. This Orangeville hotel is an all-suite property that offers a quiet refuge for business travelers and a relaxing atmosphere for vacation getaways. The oversized guest suites are equipped with a kitchenette including a refrigerator, microwave, coffee maker, wet bar and dishware. This year-round resort in Orangewill offers a picturesque countryside. There are 104 luxury rooms and suites, 14 meeting rooms and a full-service spa. The resort is home to a championship 18-hole golf course as well as ski and snowboard runs. Located in downtown Orangeville, Ontario, Atlanta Motel is 1.7 km down the road from Theatre Orangeville Stage Productions. The motel features a front desk that is staffed 24 hours a day. Free Wi-Fi access and a flat-screen TV are part of every room. They have a microwave and a refrigerator and are furnished with a work desk. Located in Orangeville, this B and B features free WiFi. Featuring a shared lounge and a seasonal outdoor pool. There is also a concierge service, and luggage storage. Rooms are complete with a private bathroom, while some rooms have a seating area. A Full English/Irish breakfast is served daily. This hotel in Orangeville makes your stay better with our free continental breakfast and free WiFi Internet access. All of our guest rooms come equipped with a refrigerator, microwave, and a flat-screen HDTV. Our hotel also offers free parking for your car or large-vehicle. This Orangeville motel offers simply furnished rooms with free Wi-Fi. BBQ facilities are located on-site. A cable TV is offered in each air conditioned guest room and include a microwave, refrigerator and tea and coffee-making facilities. There is a large resort-style backyard with a children’s playground. This Alton hotel features an award-winning restaurant, full-service spa and guest rooms furnished with European and Canadian antiques. A wall-mounted flat-screen cable TV is equipped in every room. They include a seating area and a desk. The Spa offers 11 private treatment rooms and 3 hydrotherapy rooms. Indoor and outdoor pools are available along with gym and a healing garden. The Knights Inn Toronto North is conveniently located in the business district of Richmond Hill which makes us ideal for both business and leisure travelers. We are conveniently located in Richmond Hill, off of Highways 404 and 407, and are only minutes away from Canada's Wonderland, the Toronto Zoo and the Ontario Science Centre. The rooms at this hotel in Richmond Hill feature Queen-sized beds with plush pillow-top mattresses, flat-screen TVs, microwave and refrigerator and work desk.Free high-speed internet access throughout the hotel and free parking to all our guests. Our Richmond Hill motel has free cable TV in each room, as well as free Wi-Fi. The hotel is on Yonge Street in the Richmond Hill, near Toronto. Easily reached from Highway 407, we are 500 m from the Richmond Hill Centre Terminal. The Richmond Hill Golf Club is 2 km away from the hotel. We have both smoking and non smoking rooms. We are a 100% smoke free hotel located in Toronto's northeast business area (Richmond Hill / Markham). This contemporary 10 story hotel is located 1 block north of Hwy 7 at Leslie St., with easy access to Hwys 404 & 407. We have an indoor salt water swimming pool, fitness centre with treadmills, cross trainer, fitness cycle and spinner, laundry, business centre, meeting rooms and ample parking. Situated in Richmond Hill, Ontario, bordering the town of Markham, this hotel offers a spacious athletic club, an indoor pool and a salt-water outdoor pool. Guests can take a free fitness class, workout in the 24-hour fitness center or relax in the whirlpool tub or with a massage in the spa. Rooms include a safe, air conditioning, TV, and Jacuzzi. Wifi available at extra charge. Oak Inn welcomes you to the mega city of Toronto. They are conveniently located at the north gateway of Toronto to fulfill your needs whether you are traveling for business or pleasure. This hotel always offers you clean, fresh and affordable rooms. Feel at home in a comfortable guest room in Bolton. Enjoy thoughtful amenities such as a microwave, mini-refrigerator, coffeemaker and free WiFi access in each room. Wake up to free hot breakfast, or grab a free to go Breakfast Bag. Unwind after a long day with a dip in the indoor pool, or work out in the spacious fitness center featuring weights and cardio equipment. Located in Nobleton, Ontario, these heritage houses feature rooms with free Wi-Fi, air conditioning and private bathrooms. A gourmet continental breakfast is served in the private dining room. Wine tastings and live music are often scheduled. The McMichael Canadian Art Collection in Kleinburg is 7 km from Danile’s Bed and Breakfast. Canada's Wonderland is a 20-minute drive away. This Burlington motel offers free Wi-Fi and rooms equipped with a microwave and refrigerator. The rooms are spacious and furnished with a seating area. Each includes cable TV, a radio and hair dryer. Guests can use the laundry facilities or relax in the picnic area. Parking is available on site and is free of charge. Take a video tour of this hotel!Located in the Burlington/Oakville Ontario Area is the Holiday Inn Burlington Hotel and Conference Centre. This Burlington conference hotel offers warm hospitality, and exceptional services suited to please business and leisure travelers alike. In addition, this conference hotel is home to Burlington's premier conference facilities. Our downtown Burlington hotel is newly designed with fashionable furnishings, fine finishes and an inspired nautical colour palette. 129 guestrooms blend contemporary style with modern comfort. Amenities include complimentary Wi-Fi, mini-fridges and microwaves, plush pillow-top mattresses with crisp, fresh linens and white duvets, flat-screen TVs and more. Motel 6 - Toronto West-Burlington/Hamilton features coin laundry facilities and free, on-site parking. All guestrooms offer expanded cable channels at this pet-friendly motel. Attractions such as Bronte Creek Provincial Park and the Burlington Art Centre are within 5 miles (8 km) of the Burlington Motel 6. Within a short drive, guests can explore Dundurn Castle or Wild Waterworks amusement park. We are ideally located in Burlington near the Royal Botanical Gardens and African Lion Safari. Hotel guests will appreciate the Beach Way Park located near the hotel for an afternoon of hiking, cycling or walking. A variety of restaurants are located within one kilometer of the hotel. We are located in the heart of beautiful Burlington and is less than two miles from the Mainway Recreation Centre and minutes from IKEA home furnishings, the Royal Botanical Gardens, Burlington Convention Centre , The Waterfront at Downtown Burlington and Spencer Smith Park. Our all-suite Burlington hotel conveniently between Toronto and Hamilton in the city of Burlington. Enjoy a restful night in one of our spacious studio, one or two-bedroom suites. Each suite offers separate sleeping and living areas, as well as many comforts such as a fully equipped kitchen and complimentary WiFi access. Wake up to a complimentary full hot breakfast every morning of your stay.